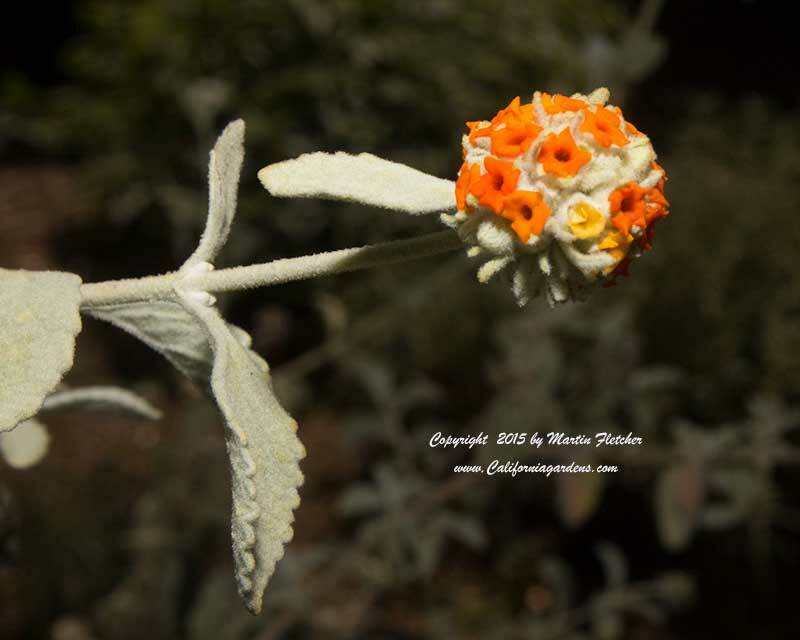 Buddleia marrubifolia has spectacular fuzzy foliage and beautiful round clusters of orange flowers that are a bit less than 1" combined. The Woolly Butterfly Bush grows to 5 feet tall and wide. Buddleia marrubifolia is very drought tolerant. The Woolly Butterfly Bush is native to washes in the mountains of Southern Texas and Northern Mexico. As you might expect from these origins Buddleia marrubifolia is very drought tolerant once established. The harder issue is often overwatering rather than underwatering. Buddleia marrubifolia is tolerant of a moderate amount of shade. Plants prefer well drained soil. In colder areas Buddliea marrubifolia is deciduous. Plants are winter hardy to 15° F, at this they may be coming back from the roots. Buddleia marrubifolia attracts the Red Admiral and Mournful Duskywing butterflies and is a great choice for a butterfly or hummingbird garden in a hot climate. Flowers and foliage of Buddleia marrubifolia the Woolly Butterfly Bush. High resolution photos are part of our garden image collection.